The numbers in Australia are pretty good too, compared to South Africa...there are always those who complain about the law, but obviously the road rules make a difference! It makes my heart ache to see those numbers pile up in the carnage on our SA roads. Irresponsibility and law-dodging, no respect for life or property... So why do I feel its good to be here? I have no idea. And its my choice, not to be inflicted on anyone else, so I'm not preaching. Maybe wandering around the world as a child makes me grasp onto SA as home... I don't know. But I long for the day when SA can join Australia or New Zealand in their admirable road and personal safety record. I think it has alot to do with the public in each nation's perception of the law and their respect for it. There is very little respect for the law in SA, whereas here people want to follow the rules. I used to think there was a greater sense of morality in this country than in SA, but there isn't. Their sense of responsibility is higher and not linked to any kind of moral standard. On the other hand, in SA there are more people who adhere to a moral standard based on a belief system, but they are more willing to break the rules... I was one - the one and only speeding fine I ever got was on the way to church! But the fact remains and the numbers don't lie - it is safer to drive here. There was one taxi that was stopped for overloading going on a school outing with pre-schoolers and teachers. 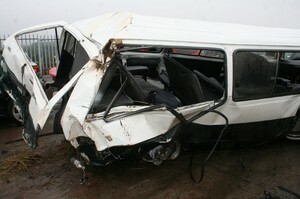 There were 106 people in the taxi – built for 30 including the driver! There were kids on the floor and sitting on top of each other. And these were teachers! You’d think they would know better, but then, this is South Africa! Latest road death stats since December 1st in South Africa now exceed 1100!